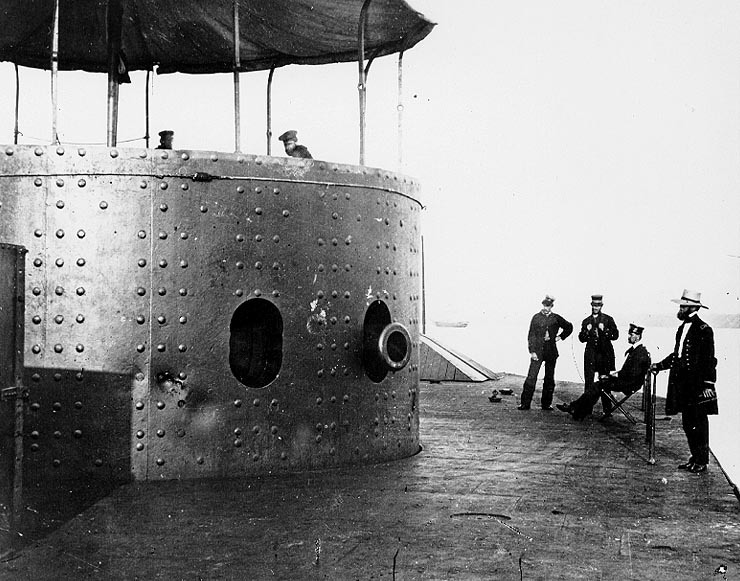 Type and Characteristics - Steam ironclad monitor, designed by John Ericsson, built by Continental Iron Works, laid down 25 October 1861, launched 30 January 1862, completed 25 February 1862, 987 tons, 172ft long x 41ft 6in beam x 10ft 6in draft, 6kts, iron-plated armour - 2-4 1/2in side, 8-9in turret, 1in deck, armed with 2-11in Dahlgren smoothbore guns, c60 crew, commanded by Lt John L Worden. Log Period and Areas of Service - 1862, Civil War. 27 February - Departed New York Navy Yard, but her steering failed, and returned. 6 March - Departed under tow for Virginia Capes. 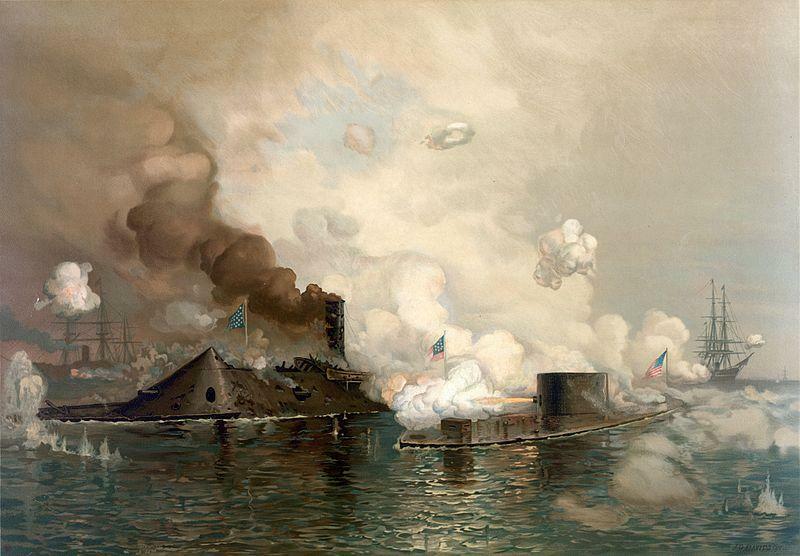 8 March - As USS Monitor approached Cape Henry in the afternoon, ironclad ram CSS Virginia (built on the hull of US Steam Frigate Merrimack or Merrimac) came out of Elizabeth River into Hampton Roads to attack Union Navy ships blockading Norfolk. US frigate Cumberland was rammed and sunk, and frigate Congress, which had run aground, shelled and set on fire. Finally USS Minnesota was damaged before the Virginia retired. 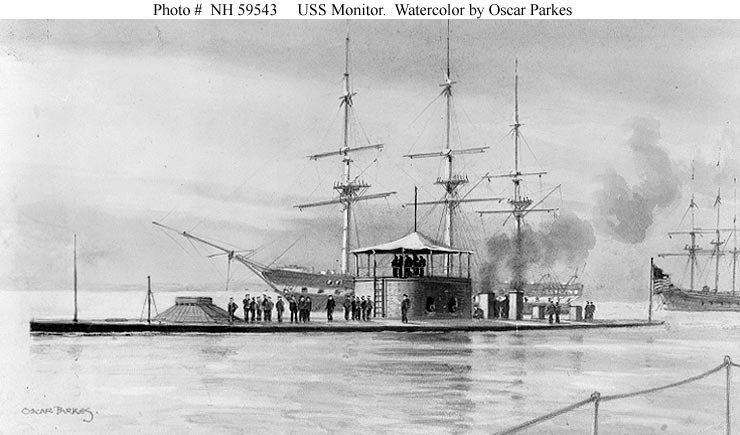 Monitor entered Chesapeake Bay and arriving at the scene of battle was directed to assist Minnesota, which was also aground. 9 March - At dawn, CSS Virginia came out again to finish off USS Minnesota, but this time met Monitor. After a four-hour action, which left both ships damaged and low on shot, Virginia retired, having failed to break the Union blockade. Monitor remained in Hampton Roads ready to continue the battle. 11 April - Virginia briefly came out from Sewell's Point, but there was no action. May - Under attack by Union forces, the Confederates withdrew from Norfolk and on the 11th, unable to reach Richmond, Va, the CSS Virginia was set on fire and blown-up. 15 May - Monitor with Union ironclads Galena and Naugatuck were stopped in their attempt to reach Richmond and withdrew. The ships continued to provide gunfire support to Union troops. Summer - Monitor helped cover the retreat of the Union Army back in to Northern Virginia, and then carried out blockade duties in Hampton Roads. 24 December - Ordered to North Carolina for operations against Wilmington. 29 December - Departed Virginia Capes under tow by USS Rhode Island for Beaufort, SC. 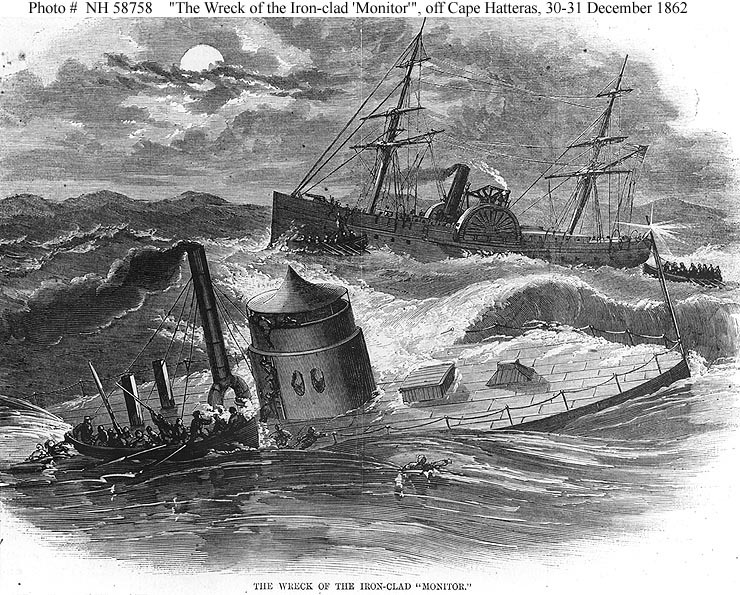 Fate: On the 31 December, foundered in a storm off Cape Hatteras with the loss of four officers and 12 men. Her wreck was discovered in 1973, and a number of parts have been raised, including her engine and gun turret.